Former Dallas Cowboys quarterback and Monday Night Football personality Don Meredith passed away this week. In remembering the likeable Dandy Don, his Texas twang, his snakeskin cowboy boots, and his irreverence in literally drinking and smoking pot live in the broadcast booth, the tribute tracks back to the man who put Don on the air. That was genius Roone Arledge, known widely as the most innovative creative influence in the history of television. Before Roone, sports were addressed with a serious, shall we say "noble" tone. Roone's goal was to mix show business with sports. He started with the 1960's Saturday afternoon must-see Wide World of Sports, right about his hunch that women and a non-hard-core-sports audience would be curious to watch wrist-wrestlers from Petaluma, California, and lumberjacks from Hayward, Wisconsin. But it was 1970, when Roone decided to swoop Joe Namath into our prime-time living rooms, that sports catapulted into the heart of the American zeitgeist. The defining show was Monday Night Football. To my mind, this was the moment that baseball was usurped by football as America's game. Frank Gifford, the ex-Giant great, was the straight man in the booth, if you will. The irascible and intellectual Howard Cosell was the outrageous personality. And Dandy Don Meredith was the easy-going everyman, boots propped on the desk, never afraid to laugh out loud at Cosell's blatant absurdity. Whereas today's announcers are pushed by executives and advertising dollars to try their hardest to keep the audience interested to the last moment of a telecast, even through a blowout, Meredith spoke football truth. When the game outcome was evident, even if plenty of time remained, Don would throw back his head like an old hound dog and croon, "Turn out the lights. The party's over." Monday Night Football was such a hit, became such an immediate cornerstone of national bonding, that the then-hugely popular Monday bowling leagues had to switch to Tuesdays. Movie theaters lost attendance on Monday nights. And one Washington state hospital declared an informal policy of avoiding delivering babies during Monday night games. The sign of the magnitude of Monday Night Football arrived exactly 30 years ago yesterday. The game kicked off, as usual, at 9pm Eastern. It was during the fourth quarter, at 11:10pm that John Lennon was shot outside his apartment building in New York City. Pre-Internet times meant that the vast majority of Americans first heard the tragic news during the game. Out of commercial, you heard Frank Gifford almost whisper to Cosell, "We have to address this." And Cosell deftly turned from a simple game to a seminal moment of world news. I remember the moment very well. I myself had just started working as an announcer for Wide World of Sports. Our crew was in Oahu, covering a surfing event, and we gathered that night to watch the football game together. Those of us of a certain age always ask each other where we were when the news of President Kennedy's assassination hit. But I'm guessing that this, John Lennon's murder, was the other moment all of us old enough to remember 1980 also have etched in our collective memory. Do you remember where you were? Did you also hear the news on Monday Night Football? Write us about your experience at KCRW.com/TheScore, will you? Let me finish with just one word today. IMAGINE. 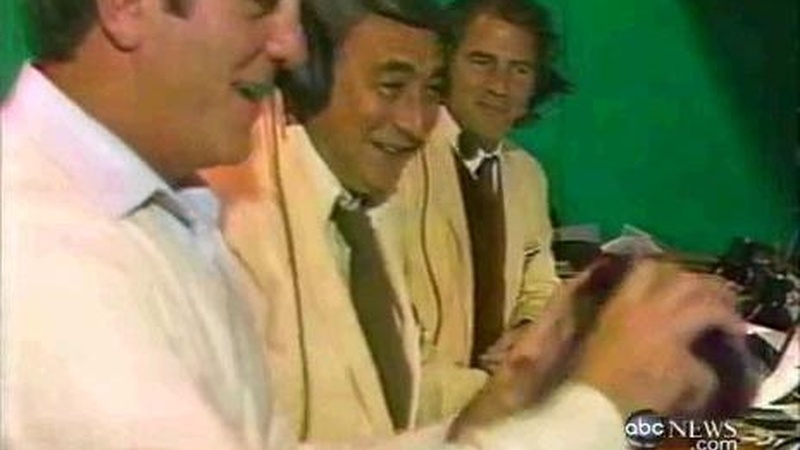 Banner image: Screen grab of (L to R) Dandy Don Meredith, Howard Cosell and Frank Gifford in the ABC Monday Night Football press booth.